There are a lot of painting tips for beginners on the interwebs. And thousands continue to get published. This is no surprise as most beginners find it difficult to handle their own painting jobs. Prime Before Painting for Better, Longer-Lasting Results. Priming before you paint can make a world of difference to the outcome of your paint job. Please remember to read all label directions as not all projects recommend the use of a primer. Exceptions may include painting a floor or staining a deck. Why is it so beneficial to prime the surface before painting? They help the finish coat to properly bond with the surface underneath. The two main types of primers are primer-sealers and under-coaters. If you have unpainted surfaces or surfaces where most of the original paint isn’t there anymore, call for a primer sealer. You’ve probably seen some of these at your local box stores. These usually include the wordings “sealer” or “for new drywall” on the label. Also, you should use under-coaters to form a bond between coats of paint. Know your surface and choose the primer accordingly. For standard drywall surfaces, latex primers are better. This is because they don’t raise the nap or fibers on the surface of the wallboard. For plaster surfaces, you can use a latex or alkyd primer. Alkyd undercoats are appropriate for wood trim. I recall doing a job where the walls in a fairly new house had so many coats of paint – an attempt by the builder/contractor to hide the lap marks. In this case, I came in and did one wall for free to show how an alkyd primer can be used first to get a nice level canvas for the finish coat. For best results when painting over wallpaper, use an alkyd primer or alkyd primer/under-coater to seal against potential bleed-through. Once you have selected and applied the appropriate primer, you are ready to start with the finish coat. Be sure to wait the appropriate time for drying of the primer though. A common question for many of us after finishing a painting job is how to dispose of paint cans? Well, what you should NOT do is to throw the can with paint still in it directly into the garbage. This is clearly an environmental hazard. It’s more common now with cities and municipalities to have a designated place to drop off old paint cans for reuse and proper recycling. This is by far the easiest and safest method of disposing of paint. Sometimes, you just don’t have a drop-off location. 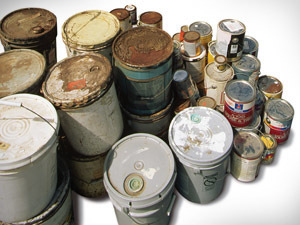 If this is the case, you can follow these steps to properly dispose of your paint cans. Some paint stores carry something called “Waste Paint Hardener”. It basically will harden the left-over paint in the can. This is so you can then dispose of it via normal garbage collection. You can also fill a disposable container with sawdust or sand and pour the excess paint in it. Then allow it to dry completely before throwing it out in the garbage. If there is only a little paint in the can, you can also leave the lid off and let it dry out completely. Note that you should do this in a well-ventilated area. Painting is one of the most popular home improvement projects you can undertake. However, it can be more difficult than you might think. Whether you’re planning an interior or exterior painting project, hiring a painting contractor will save a lot of time and energy in the long run. Are the employees experienced painters? Make sure the company hires skilled workers. Ask what training or qualifications they have. Can the painting contractor make recommendations on what materials will work best for your project? A professional keeps up-to-date on the latest products and techniques make suggestions for colors and finishes and is knowledgeable about the latest trends. Experience counts. Will they offer a maintenance program? Some will, it’s worth asking. How much do they charge? Getting the lowest price should not be your first consideration. You want to get someone with skill, experience, insurance, awareness of safety issues and good workers. That will not likely be the guy with the lowest bid. It doesn’t need to be the highest bid either. Just be sure not to hire on price alone. Look at the whole picture. Painters operate on very tight profit margins. Some homeowners hire college students and are happy with the work. If the price seems too good to be true, however, it probably is. Now that you know how to look for a good contractor, where can you go to find one? At renovationexperts.com, you can get free estimates from contractors in your area who are prescreened for experience, licenses and insurance. Renovation Experts is a premium network of over 3,000 remodeling contractors, who carry out remodeling projects for any part of the house, from the attic to the basement. Locate and hire a contractor, get an estimate for your project and do it with the peace of mind that comes with knowing you’re using professionals.